Rain. Thunder possible. High 63F. SSW winds shifting to NNW at 10 to 20 mph. Chance of rain 100%.. The tall, lanky Kirk, better known as “Woody” to all of his friends, was a former professional baseball player and well-known pitcher for the San Francisco Giants. The shed is called Woody’s Shed, and its appearance is a testament to the fact that Rueter likes things organized, neat and clean. “I’m a neat freak, I also like things balanced and symmetrical,” he says, pointing to all of his sports memorabilia lining the walls. Even though he has an extraordinary collection of celebrity autographed baseballs including Giants fans such as Arnold Palmer, Robin Williams and Billy BobThornton, baseball is not his only passion. He loves basketball and football too, with displays of autographed footballs and countless framed sports jerseys ranging from Michael Jordan to Joe Montana. He is also a devoted Dallas Cowboys fan. Woody’s Shed features an indoor theater specifically for sports viewing, with comfortable leather recliners for all of his buddies. He’s even had their names imprinted on their seats. When the Giants are playing the St. Louis Cardinals, he invites his friends to relax in the shed on their off days. “I was never a big Cardinals fan until Matheny came on board,” Rueter says. Mike Matheny, a former Giant and now the manager for the Cardinals, is one of his close friends. “I even have his golden glove,” Rueter says proudly. He laughs when he tells the story about how Tony LaRussa, the former Cardinal manager, was never happy when the team visited the shed because it seemed after these visits the Giants would always win. Complete with a full kitchen, bar and “his” and “hers” restrooms, it’s the perfect spot for entertaining. Guests can play pool, shuffleboard, video games, listen to the jukebox or just relax. There’s even a game room upstairs for the kids to have fun and lots of room to run. Speaking of fun, Rueter proudly displays the life-size “Woody” bobble-head that was a retirement gift from the Giants. He definitely has a knack for collecting things. In fact, his hobby of collecting sports memorabilia was the reason he built his original shed. Karla’s father and stepmother, Ron and Linda Gill, live close by, and her father was instrumental in helping design the basement of the home, which is truly a work of heart. Using old barn wood, tin and logs, he gave this living space the feeling of being outdoors, recreating the exterior of barns, log cabins and even a wishing well. Many antique farm implements, which belonged to Gill’s father, are on shelves lining one wall. The basement is Karla’s favorite part of her home. “My dad has even offered to tear down barns for people just to get the wood,” she says. The basement also features a large work-out room filled with weight machines, treadmills and other exercise equipment. Here, Karla had the walls painted a bright blue. “I love color,” she says. The Rueters stay in great shape with healthy eating and exercise. Karla enjoys playing tennis on their backyard sport court, which also serves as a basketball and volleyball court with only a change of nets. An in-ground swimming pool completes their outdoor recreation area. The playroom, nestled into one eave of the house, is a bright and beautiful child’s dream with green chairs, a striped sofa, pink shag rug, colorful floor tiles and a cozy window seat. Hope’s artwork, done while she was a preschooler in San Francisco, decorates one area. Here, the girls can read, do craft projects or “play school,” which is Halle’s favorite pastime. She has apparently taken after her father when it comes to collecting, and she has several American Girl dolls. When Halle’s playroom school is in session, she is the ultimate organized teacher. Each doll has her name on the bulletin board and her own school supplies. Hope’s room has a Holly Hobby theme with a von Weitzer wall mural to match. Turquoise and cream give this room a cool and calm feel, while a poster of Justin Bieber adds a little pre-teen excitement. Hope admits to being a Bieber fan. In fact, she and her family plan to attend an upcoming concert in Oakland, Calif., followed by a trip across the bridge to San Francisco. They travel to San Francisco several times a year, where Kirk attends many Giants events, such as celebrity golf tournaments. They also love to visit Disney World. Hope collects Disney pins and has an awesome collection of erasers. Hope likes sports, too; she plays volleyball for her school. The upstairs is also home to Karla’s study, under the eave opposite the playroom. It has a feminine flair in mint green, white and pink. Bird and floral designed wallpaper catches the eye, along with the dormer window, which gives Karla a bird’s eye view of Illinois 127. The master bedroom is a soothing and tranquil area, with gold decor and cream carpet. It opens into the master bath. A garden Jacuzzi tub lies beneath a gold, faux-finish ceiling, and two large columns which give the room a Roman feel. A large shower spans the wall behind the tub. Space is abundant in both Kirk and Karla’s walk-in closet/dressing rooms, which were designed by New Space Closets, a company Joe Buck, St. Louis sports announcer, frequently talks about. Downstairs, the main floor’s marble foyer opens up to the great room. A large chandelier and cathedral ceiling give a grand welcome to all who enter. Just down the hall, the kitchen and family area is an open design. Kitchen cabinets from Herzog Kitchen and Bath, feature a hidden refrigerator and refrigerated drawers. The granite countertop, European style range hood and breakfast bar compliment the cabinetry and provide a perfect space for the family of four to gather. “This is where we live,” Kirk explains. On the family room wall, Karla points out a beautiful, hand-carved, hand-painted mantle she bought from the same couple who created her daughter’s carousel pony. A collection of original paintings by Amy Rice, a mixed-media artist out of Minneapolis, are placed strategically throughout the home. In the Rueter home, every room has a television. Kirk says he wouldn’t want to miss anything happening in the world of sports, so there’s even a TV hidden in the bathroom mirrors. But technology doesn’t stop there. in the nearby lake. A high-tech lighting system throughout the home makes it a snap to turn off all lights at the same time with one touch. Changing light bulbs in the great room chandelier is simple too, because a pulley system extends and retracts the fixture at the push of a button. Karla and Kirk worked with Mim Phillips, an interior design coordinator from O’Fallon, to create the home of their dreams. “We had never built a house before so we were really out of our element,” Karla says, who keeps busy doing volunteer work for the girl’s school, keeping up with the girl’s activities and keeping up with the house. The couple do all of their own housekeeping, which is no small task. The home was designed and built by the Stiegman Brothers, local Nashville contractors. The Rueters purchased the property in 1998, which was originally slated to be a subdivision. Kirk found the house design while studying home plans. “I knew that it had to be a symmetrical design,” Kirk says. 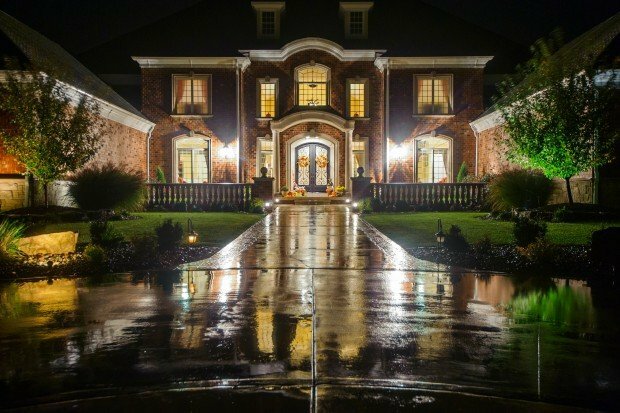 The symmetry of the house, the pitch and angles of the roof line, the brick and stone, the windows and overall setting, make one beautiful statement, especially when seen at night with all the rooms aglow. As the Rueters settle in on their sofa for a Christmas card worthy family picture, complete with felines, it’s evident they are close. Watching this family in action, there is no doubt their home was built with love, not only for love of sports but, more importantly, love of family. 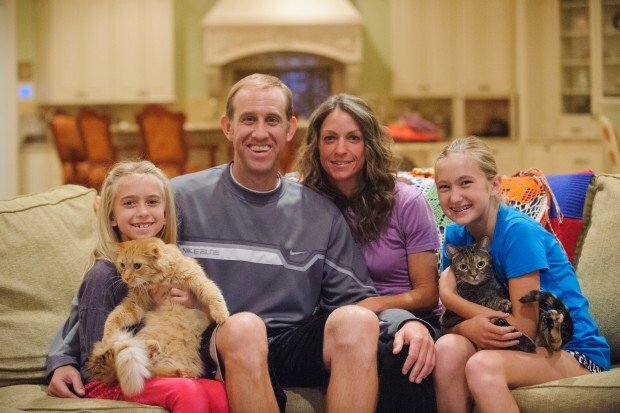 After the photo, Karla and Hope return to the homework table, Halle plays with her cat, and Kirk? Well, after all, it is Monday night, and the Cowboys are playing the Chicago Bears. Woody makes his way out to the shed, because there’s a seat waiting there with his name on it. don't break your arm patting yourself on the back. also: thanks for the web address; I Goggled "shameless self promotion" and found it there too.